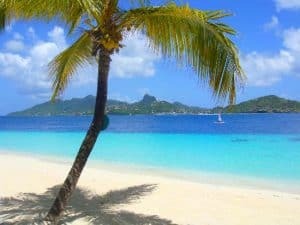 St Vincent & The Grenadines Travel with immerse you in white sand beaches, crystal blue waters, swaying palm trees, all the hallmarks of a tropical getaway in the Caribbean, without the tourist traffic of other Caribbean islands. A string of 32 islands and cays comprises the nation of St. Vincent and the Grenadines. St Vincent has long been the destination of choice for the elite travelers who moor their private yachts off its secluded shorelines. While it may sound like a playground for the rich and famous, you don’t need your own yacht to enjoy St Vincent & the Grenadines. Ferries make exploring St Vincent & the Grenadines a breeze, and with so many islands to choose from, there’s sure to be one that perfectly meets your needs. St. Vincent is one of the least touristy islands in the Caribbean. Hotels on St. Vincent are almost all small, locally owned and operated, and not glitzy. Restaurants mainly serve local food such as grilled fish, stewed or curried chicken, rice, and “provisions” (root vegetables). The beaches are either tiny crescents of black or brown sand on remote leeward bays or sweeping expanses of the same black sand pounded by Atlantic surf. The Grenadines, on the other hand, dazzle vacationers with amazing inns and resorts, fine white-sand beaches, excellent sailing waters, and a get-away-from-it-all atmosphere. The islands of St. Vincent and the Grenadines are fairly close together. Whether you go by boat or by plane, traveling between them is not difficult. And each island is unique—once there, you’ll definitely want to sample more than one. To learn more about all the beautiful beaches on St Vincent & the Grenadines, visit here. Now view our St Vincent & the Grenadines Travel guide to help plan your next Caribbean vacation! The temperature stays fairly constant throughout the year, and it rarely gets below 65 degrees F. The average high in January is 85 °F and the average high in July is 86 °F. It might be somewhat warmer in some interior areas of the larger islands, especially St. Vincent, which supports a tropical rain forest, but the ocean moderates the air temperatures to keep them relatively steady. The dry season in St. Vincent and the Grenadines is the winter and early spring, from January through May. The wettest time is the summer, with July receiving the most precipitation. The hurricane season typically follows the rainy season, from June through November. Unlike the much of the rest of the Caribbean, St. Vincent and the Grenadines are far enough to the south that they miss many of the storms. Usually just getting some stray weather from the outer bands, with very little severe weather. High season runs from mid-December through mid-April; in the off-season, rates at large resorts may be reduced by up to 40%. Seasonal discounts vary dramatically by resort and by island, with some of the luxury resorts offering specials periodically throughout the year; the most extravagant resorts, however, are always expensive. The small, less expensive hotels and guesthouses have little or no seasonal changes in their rates. You’ll need to present a valid passport and a return or ongoing ticket to enter St. Vincent & The Grenadines. There is a $40 XCD (or $15 USD) departure tax from the islands that applies to travelers above the age of 12. You can pay the tax in either Eastern Caribbean dollars or U.S. dollars at the airport prior to departure. No Visa is required to visit St Vincent & the Grenadines. In the Eastern Caribbean, the “gateway to the Grenadines” has no direct flights. The best connections are through Barbados and Antigua. From Barbados you can take LIAT to most of the Caribbean. SVG Airways makes daily shuttle runs from St. Vincent to the islands of Mustique, Union, and Canouan. There are also charter flights available that connect with Grenadine Islands with airports Charter arrangements can be made on Union Island. Flights within SVG are a quick and inexpensive way to shuttle around the country. There are airports on all the main Grenadine islands except Mayreau. There are a number of airlines running regular services between the islands. Grenadine Air Alliance, Mustique Airlines, and SVG Air. You can usually find someone who can get you between islands in the Grenadines. Usually it is going to be a small, open fishing boat, for four people with minimal luggage. The price is negotiable, so make sure you get a price set before you take off. You could also hang out dockside on Union Island, or at the bars popular with the captains to see what you can arrange. The main islands are easily accessible by ferries. Check the schedule in advance, because they can often change. The buses are actually minivans that are usually crammed full with people. You can expect 20 other passengers squeezed on with you. There is also a conductor on board who takes care of the cash and assigns seats. When you get to your stop, tap the roof or get the attention of the conductor over the thumping music that will be playing. The buses will stop just about any where. You probably only want to drive on St Vincent. It has plenty of roads for you to explore on. Driving will be slow because of the very narrow and winding roads. Rental car rates run an average of $60 – $70 per day. There are car rental agencies on St Vincent and Bequia, but most of the Grenadine Islands have no car rentals. On some islands there are no roads. Remember that driving is on the left side of the road and you must have a visitor license, which you can get at the central police station on Bay St. in Kingstown, or at the airport. Taxis are not metered. Settle on the price before getting in the taxi. Taxis are always available at the airport in St. Vincent, and the fare from the airport to Kingstown or Villa is $12. In Bequia, the taxis, usually pickup trucks with their beds fitted with benches accommodating four to six people under an awning, will take you to Port Elizabeth, to the various hotels, or on a day of sightseeing. 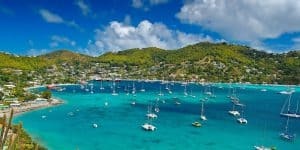 Bequia is a relaxed and friendly Caribbean island with an international flair, tailor-made for sailing enthusiasts, beach lovers and honeymooners. Enjoy white sand beaches, sheltered bays, turquoise seas and a selection of lovely hotels, well appointed villas and apartments, and excellent restaurants and bars. Don’t miss our world famous Easter Regatta. Discover a Caribbean island that combines luxury and elegance with natural beauty and local charm. 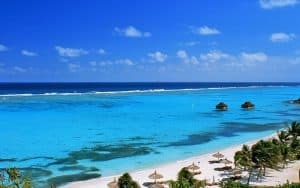 Famous for the The Pink Sands Club and Jim Fazio designed, 18 hole championship golf course, Canouan has one of the Caribbean’s longest barrier reefs, gorgeous white sand beaches and turquoise seas. Rub shoulders with the rich and famous on a Caribbean island that blends elegance and luxury with natural white sands, palm trees and turquoise seas. Pick up a mooring in Britannia Bay, stay at the world famous Cotton House, free up at the Blues Festival and the lively atmosphere of Basil’s Bar, unwind in the absolute tranquillity of a deserted beach. Mustique is altogether beguiling. Visit Union Island, one of the undiscovered treasures of St. Vincent & The Grenadines. Unsophisticated, relaxed and friendly, Union is still off the beaten track. A charming destination and a great base to pick up a mooring and explore the natural beauty of this region, Union is a paradise for yachting enthusiasts, scuba divers, hikers and sun worshipers. Discover an exclusive private island resort with powder white sand beaches, turquoise seas, swaying coconut palms and unsurpassed beauty and seclusion. With an emphasis on tranquility, privacy and luxury, Palm Island is an esoteric refuge for those seeking an exclusive Caribbean escape. Palm Island is among the Top Caribbean All-Inclusive Resort Islands. The longest-established yacht charter company in St Vincent and the Grenadines, Barefoot is a locally-owned company with a worldwide reputation for excellence. A member of the American Boat & Yacht Council, Barefoot operates the only ASA sailing school in the country, and offers a large fleet of bareboat monohulls and catamarans and luxury fully crewed yachts. For more information call 784-456-9526, or visit them on the web at Barefoot Yacht Charters. Bamboo Adventures SVG offers a team of travel professionals that creates a unique and personalized Travel services for St. Vincent and the Grenadines. For discerning travelers who expect the highest level of service, and attention to detail from the minute they begin planning their trip, to the day they return home. They offer the most exclusive mix of enjoyable, memorable Island Excursions ranging from soft adventure to sight seeing to culture and heritage. For more information call 784-570-8000, or visit them on the web at Bamboo Adventures SVG. Wow, looks beautiful. My wife and I are planning to do a cruise in the Caribbean but not sure which cruise to take as they stop in different islands. We get to spend a day at the islands when they stop off. 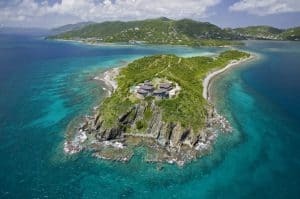 Do you have any recommendations for islands that a re good for one day? We will look into your tour recommendations. Hi Dave, hands down you want to do an Eastern Caribbean Cruise. Visit any of these: Bahamas (Nassau), St Martin, St Thomas, Dominca, and Barbados. I would say Puerto Rico, but they were devastated by the hurricanes this past hurricane season. Please let me know if you need any additional information. Thanks for visiting St Vincent & The Grenadines Travel! Wow, St Vincent and the Grenadines looks amazing! I have never been there but reading your post has inspired me to put it on my list. 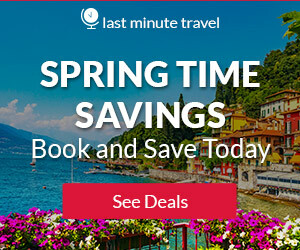 We have been looking at a Caribbean vacation, and now I have so many options! Lots of great info and pictures, thank you! It is amazing Angela and thank you for reading about St Vincent & the Grenadines travel. I think if you decide on this wonderful Caribbean Island, you will not be disappointed. Let me know if you have any questions you need answered. This is great! You have done an awesome job describing and giving tons of good information for St Vincent! Nice Website with so many beautiful destinations to choose from. You have made it difficult for me to decide! I look forward to booking my trip with you next year, and I will keep in touch when I am ready! Hi Pastor Gabriel Helene! Thanks for reading about St Vincent & the Grenadines Travel. I know, there are a lot of beautiful destinations around the world, and Caribbean Islands are wonderful. Please let me know when you are ready, I know that I can get you a great package deal. As always, thank you for visiting! All information in one place concerning travel. Seems like a luxury to me. I have never been to St Vincent, but would love to in the up coming new year. The place looks like the real face of mother nature… freshness, blueness and everything nature. This has got me really day dreaming and hoping my wishes would develop wings. You are keen to details and your post is just woooow. Plus this is the right time for information like this. Christmas is just around the corner. I enjoyed reading your post. Thank you very much. Thank you so much for reading about St Vincent & the Grenadines Travel. Yes, a luxury but not out of reach. You would be surprised, how comparable it is in price for a vacation here, or to most Caribbean Islands for that matter, compared to any other beach vacation. Keep dreaming, as that is what drives us to make them come true. The only caribbean destination I’ve been to so far is the Cayman Islands, and I enjoyed it very much. I have heard about SVG, but never looked into going there in-detail, which is why your post is very helpful for me. Based on the YouTube video, it looks like there are a lot of places to see and explore. I’m not a fan of non-metered taxis though. I was wondering if it is ok for my to bring my wife and kids to SVG? Both my kids are still quite young – 4 and 1. Would it be too early for them? Hi Marco and thanks for reading about St Vincent & the Grenadines Travel. There are restaurants and accommodations that go out of there way to cater to families with children. I don’t think they are too young at all. When you are ready to start planning let me know, and I can recommend resorts to you that are happy to have families, and have lots of activities for them. They would enjoy the birds, the turtles, going to the beach, playing in the water, building sand castles. There is so much for children to do, and they would absolutely have a ball. Please let me know if you have any other questions Marco. This is amazing. I have been ready to take a vacation for the last couple years, and I really think your article has swayed me in the right direction. You have everything a person would need to know all in one place. Great information! Thank you so much Bradford for visiting St Vincent & The Grenadines Travel. I am sure you would absolutely have a wonderful time in the beautiful Caribbean Island of St Vincent! I am glad I could push you in the right direction! How much money would you consider saving up before going on an adventure to a island or cruise? Would you suggest going alone or as a group to balance out the money spent from person to person? Your vacation reviews are amazing. Reading this article makes me want to travel now. You have such a great way of detailing everything a traveler needs , all the information necessary. Good job. Keep it up. This place looks amazing! The weather is great, I love how it doesn’t get higher than 85 so I would love to spend summers there. I hate dealing with 110s where I live. Mac’s Pizzeria sounds delicious, I would love to try the pizza while sitting on the terrace looking at the amazing views. I love how you always give such amazing details, great post! Thank you so much Melissa! Oh, yes how I would love to spend summers in beautiful St. Vincent. And I agree, 85 is pretty darn perfect! Thank you for visiting! Wow, looks amazing. I love how the weather doesn’t get too hot also. The last vacation I went on was to Cuba in the beginning of September which my friends and I actually missed Hurricane Irma by 3 hours. We were the last flight out of there. I really want to go somewhere very nice next time. St. Vincent and the Grenadines seems breath-taking. Will definitely put it on my vaca list. Such a good review also. Thank you! Wow, you are so lucky you got out of there in time. It is scary I know that, we had to evacuate from our house. I am glad you enjoyed the review of St Vincent & The Grenadines Travel. Please come back again when you are ready to plan your next vacation. I would be more than happy to help you get a good deal. It looks beautiful! Thanks for the recommendation. Do you have a price rating for the hotels you have suggested? What would you recommend for a couple, traveling on a budget? Thanks for visiting St Vincent & the Grenadines Travel Kathryn. I would recommend the Spring House Bequia. It is not on my list, but the price is certainly right ($119 per night) and it is a 5 star hotel. Great for couples 🙂 Please let me know if you need anything else.